When the masses think, the intellectual dies. The Union des jeunesses communistes marxistes-léninistes (Union of Marxist-Leninist Communist Youth, hereafter UJCml) – was originally a French student organization formed in December 1966. It resulted from a split within the official, Communist Party-controlled student union, the Union of Communist Students (UEC), by a group of students close to Louis Althusser and led by Robert Linhart. The first seeds of the organization were sown, however, in the period just before this split, when the UEC was wracked by a struggle between two tendencies: a Trotskyist faction allied with a democratizing, reformist faction dubbed the “Italians,” because they wanted to follow the Italian Communist Party’s democratizing example, on one side; and a faction led by Linhart that defended the French Communist Party (PCF) orthodoxy on the other. After successfully purging the Italians and winning control of the UEC, this faction then set its sights on that same Party orthodoxy, undertaking a primarily theoretical rectification and defense of Marxist theory inspired by Althusser himself, against perceived deviations and revisionism within the Party’s theoretical and strategic framework. The virulence of this campaign led to this faction being expelled from the UEC in its turn, and opened the way to the foundation of the UJCml. The foundation of the UJCml took place during a momentous period. The December 1966 formation of the group coincided with the publication in that same month of an issue of the journal Cahiers marxistes-léninistes, devoted to the “Great Proletarian Cultural Revolution” that was launched in China in August of the same year. The issue included an unattributed text written by Louis Althusser with the title “On the Cultural Revolution.” 3 In this article Althusser argued, with a sober enthusiasm, that the revolutionary process then currently underway in China represented an “unprecedented” event in this history of the international communist movement, an event that had nevertheless been anticipated by Marx, Engels and Lenin: the setting in motion of a cultural or “ideological revolution” after an earlier seizing of the means of production and state power. Undertaken in view of protecting an ongoing revolutionary process always threatened with a regression that could divert it down the “capitalist road,” the ideological class struggle placed on the agenda in August of 1966 entailed the emergence of new forms of organization (in particular the “Red Guards”) distinct and in some sense even autonomous from the Party. For good reason: the role of these organizations, according to Althusser, was to “oblige the Party to distinguish itself from the State” after a period during which these two forces underwent, perhaps ineluctably, an at least “partial fusion.” 4 If Lenin had already, at the end of his life, seen the need to encourage the formation of non-party organizations – such as the “Worker and Peasant Inspectorate” tasked with, as Althusser puts it, “regulat[ing] the relations between the Party and the State in order to avoid the pitfalls of bureaucracy and technocracy” – it was only with the Cultural Revolution itself that a proliferation of mass ideological organizations capable of singling out so-called “capitalist roaders” within the Chinese Communist Party leadership began to practice this “regulation” on a mass scale. The Cultural Revolution was launched in view of continuing and even intensifying class struggle, in a society in which the means of production had been socialized and the state subsumed, to the point of “fusion,” by the Communist Party. It aimed at bringing that struggle to the heart of the Party itself. The subsequent unfolding of the Cultural Revolution would reveal the risks entailed by the unleashing of such forces. The UJCml, in its struggle against the “revisionism” of the PCF leadership, clearly took its inspiration from the ideological struggles in China and the forms of organization that emerged within these struggles. (In August 1967, the leadership of the UJCml would make the obligatory trip to Beijing to witness these events firsthand.) But the historical situation was, to be sure, completely different: the France of 1967 was hardly a socialist country torn between the temptation to capitalist relapse and the will to surge forward along the path to full communism. The task the UJCml set for itself was more modest, if still enormous: it would rebuild, from scratch, a properly revolutionary, mass communist party of the sort the PCF, in the UJCml’s estimation, once aspired to be. The UJCml would last a mere year and a half, being forced to disband by the French state after the tumultuous events of May and June 1968, while also having encountered its own, internal limits during those months. We can identify three basic tactical phases it developed during this period. The first was the formation, soon after the founding of the group, of what were called “Vietnam Base Committees,” organizations meant to full-throatedly support the Vietnamese struggle against American imperialism in opposition to both the PCF’s weak plea for “Peace” in Vietnam – the CVBs countered with “The FLN will win!” – and the rival Trotskyist National Vietnam Committee, with its more critical if still unflinching support for the Vietnamese “revolution.” These committees had the effect of carving out a space for the UJCml on a crowded left, siphoning off many radicalized lycée students in particular who might have otherwise drifted toward the hegemonic Trotskyist position. More importantly, these fledgling mass organizations gave the UJCml a foothold in popular and working class neighborhoods, where the base committees were able to maintain a sustained contact with class layers outside of its student core. Though this initial tactic was not abandoned, and continued up to May 1968, its limitations were nevertheless apparent: the UJCml’s capacity to build an authentic, revolutionary mass communist party would require contact with industrial working class of France at the point of production. It would require entering the factories. The initial form this took was a series of so-called enquêtes – inquiries or investigations – among worker (and, importantly, poor peasant) milieus in the summer of 1967. Inspired by the celebrated Maoist dictum “no investigation, no right to speak,” the results of these inquiries – which ultimately afforded only limited, external, and discontinuous contact between the militants and those class layers whose experience and self-activity were to form the cornerstone for the building of a new communist party – were deemed insufficient, if not disappointing. Regrouping at the end of the summer after a period of dispersal across France, these militants decided to take a radical tactical turn. The enquêtes would be conceived of as a set of initial surveys, a preliminary sort of range-finding that would prepare for a new “step necessary for the development of the Marxist-Leninist movement in France” and “for the building of the Communist Party.” 5 The investigations they had conducted over the summer of 1967 would pave the way for a militant implantation within the large industrial complexes on the outskirts of Paris and other major French cities. The militants of the UJCml would clandestinely enter production as “proletarian syndicalists” in order to cultivate the most combative elements of the French working class and to radicalize, from within, the communist-controlled CGT trade union, transforming it into a “class struggle CGT.” The établissement movement was launched. This sort of image is typical of Mao. Among the latter two images – “dismounting” from the horse for a few months, or “settling down” for a few years – we find the two forms of militant practice that would form the backbone of French Maoism and shape the trajectory of its first grouping: the investigation or enquête, and settling down, or s’établir (as the French translations of Mao’s Mandarin had it). The title of the programmatic UJCml tract establishing the aims, scope, and tactics of the établissement movement could very well be translated: “On Settling Down.” And the individual militants that practice this tactic: settlers. “On Établissement” is indeed a programmatic text: it states the long-term strategic goals addressed by the formation of groups of “settlers” in production, states the impasses and antinomies such a project will inevitably encounter, and proposes a series of tactical steps to resolve or avoid these blockages. If the stated ambitions of the UJCml are to build a revolutionary Communist Party to supplant the revisionary PCF, and if the task of the établissement groups is to cultivate, among the most combative workers in each production unit, leading nuclei or cores on the basis of which the “Marxist-Leninist movement” in France can be constructed, the fundamental impasse these groups will address is a universal one, corresponding to a “law of historical development”: a “divorce” between the revolutionary ideas circulating among students and intellectuals and the spontaneous combativeness of the advanced elements of the working class. The universal solution to this disconnection is, according to the Leninist line, the “fusion” of the revolutionary Marxism and the workers’ movement. But the concrete form this solution will take is what here matters. If the revolutionary ideas of Marxism-Leninism (“the ideas of the mass line, of the strategy and tactics of popular war, of the development in stages of the uninterrupted revolutionary process, of the communist ideology of ‘Serving the People’ and of going to the school of the masses, the style of work that entails self-criticism and submitting to the criticism of the masses”) always take hold first among the intellectuals, only the “working class” can “lead” the revolution. Mao’s text on propaganda work centered in part on the necessity to “remould” intellectuals. Such a transformation is identified as a key aspect of the “ideological struggle” needed to complete the construction of socialism. “On Établissement” in turn ends with a call to eliminate the “ideological terrorism” that commands “self-revolutionization” on the part of intellectuals. What is proposed instead is that the settler groups see themselves as “intermediaries” between the class and the class’s own development, and as provisional formations that, upon contact with the advanced elements of the class, will give way to “communist work groups” led not by UJCml militants but by workers won over to the revolutionary ideas of Marxism-Leninism. The posture to be assumed is more tortuous than it is made out to be in the tract. Where the post-1968 Gauche prolétarienne, composed of remnants of UJCml and the “libertarian” March 22 movement, will emphasize Mao’s conception of revolutionary organization as first and foremost the mere “systematization” – rather than production – of revolutionary ideas already circulating among the masses, or that emerge within the struggles the masses undertake, here we witness an unarticulated tension between this task of systematizing the thought that emerges from the masses themselves and the importation of revolutionary ideas from without. The sequence opened by the launching of the movement in the Fall of 1967 and closed by the resurgence of radical Christian syndicalism during the occupation and “self-management” of the Lip watch factory in 1973-4 took place a mere 40 years ago. It is, all the same, our antiquity. The period in question witnessed the most powerful wave of class struggle seen since the years following the end of the first World War. It was a crepuscular moment. The Lip episode represented the winding down of the Maoist moment and the definitive burning off of the energies released by May ‘68. That this period was characterized, as much in Italy as in France, by forms of struggle that emerged outside of the organizations of the classical workers’ movement and the struggles around wages these organizations orchestrated and managed in concert with the State and the capitalist class, makes both the UJCml ambition to radicalize the CGT from within and the central role the CFDT and its ideology of worker “self-management” played in the Lip occupation fitting, if ironic, brackets for this parenthesis. 1. ↑ Bruno Bosteels discusses Gorky’s account in his analysis of Ricardo Piglia’s “Homenaje a Roberto Arlt.” See the chapter “In the Shadow of Mao” in Marx and Freud in Latin America: Politics, Psychoanalysis, and Religion in Times of Terror (London: Verso, 2012). 2. ↑ Robert Linhart, Lénine, Taylor, les paysans (Paris: Seuil, 1976), 59-60. 3. ↑ “On the Cultural Revolution,” trans. Jason E. Smith, Décalages 1 (2012): 1-18. Most articles in the Cahiers Marxistes-Léninistes were published unsigned. Nevertheless, it should be noted that Althusser would likely have been criticized severely within the PCF had this article appeared attributed to him. The editorial conventions of the journal here served as cover. 4. ↑ Ibid., 18, 17. In his excellent account of the Chinese Cultural Revolution as perhaps the “last revolution,” Alain Badiou also characterizes this recourse to “forces foreign to the party” as an at least “partial defusing of the party and the State” (L’Hypothèse communiste [Paris: Lignes, 2009], 90, 92). Badiou’s term for this process of defusing is “désintrication,” a term that is most likely borrowed from Freud’s theory of the fusion and “defusion” of drives. Cf. Jean Laplanche and Jean-Bertrand Pontalis, The Language of Psychoanalysis, tr. Donald Nicholson-Smith (New York: Norton, 1974), 180. 5. ↑ “On Établissement,” translated in this issue. 6. ↑ The best English language account is Donald Reid’s “Établissement: Working in the Factory to Make Revolution in France,” Radical History Review 88 (Winter 2004): 83-111. 7. ↑ Mao Zedong, “Speech at the Chinese Communist Party’s National Conference on Propaganda Work,” March 12, 1957. 8. ↑ “Ênquete sur les maos en France.” Pierre Victor was the pseudonym adopted by Benny Lévy. 9. ↑ The Gauche prolétarienne will abandon their ambition to build a “class struggle CGT” in January 1969. For an exhaustive timeline of Maoism in France, see Christian Beuvain and Florent Schoumacher, “Chronologie des maoïsmes en France, des années 1930 à 2010,” Dissidences (Spring 2012). 11. ↑ The CGT of the first decade of the 20th century was receptive to anarcho-syndicalist tendencies, as evidenced in the famous Charter of Amiens of 1906. 12. ↑ See Marnix Dressen, “Le mouvement d’établissement: une résurgence du syndicalisme d’action directe?,” Le mouvement social 168, no. 3 (1994): 86. The GP was, of course, notorious for the more spectacular forms of direct action it staged outside the point of production: the theft and free distribution of subway tickets, the looting of luxury grocery stores to feed the poor, and so on. 13. ↑ Robert Linhart, Lénine, Taylor, les paysans (Paris: Seuil, 1976), 59-60. 14. ↑ The Confédération française démocratique du travail was formed in 1964, but it originated out of the Christian syndicalism of the former French Confederation of Christian Workers. 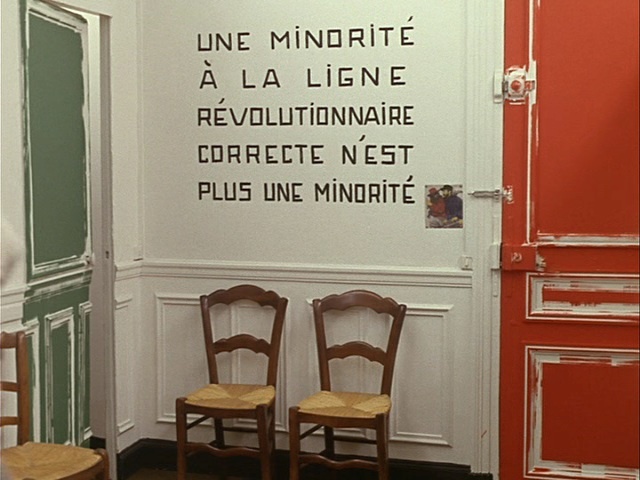 During and after May 1968, the CFDT was close to the eclectic Parti socialiste unifié (PSU) and by 1970 organized its syndical activity around the idea of autogestion, or worker self-management. 15. ↑ Christian Jambet and Guy Lardreau, L’ange: pour une cynégétique du semblant (Paris: Grasset, 1976). 16. ↑ Union des communistes de France Marxiste-Léniniste. 18. ↑ A. Badiou, H. Jancovici, D. Menetrey, E. Terray, Contribution au problème de la construction d’un parti marxiste-léniniste de type nouveau (Paris : F. Maspéro, 1969), 42. Badiou does not mention the specific imprecation cast upon this movement by the political bureau of the UJCml on May 9, one week into the rebellion: “the largest anti-communist movement since 1956,” i.e. the revolt in Hungary that was smashed by Soviet tanks. It should be noted that Badiou also discusses the ambient sentiment within the PSU of giving “priority to implantation in enterprises,” but does not address the UJCml’s settlement initiative per se. 19. ↑ Alain Badiou, “Roads to Renegacy,” New Left Review 53 (Sept.-Oct. 2008): 125-33. 20. ↑ Thanks to the editors of Viewpoint, Asad Haider and Salar Mohandesi, and Rachel Kushner, for their help in the drafting of this short essay. Jason E. Smith is Assistant Professor at the Art Center College of Design, Pasadena, CA.